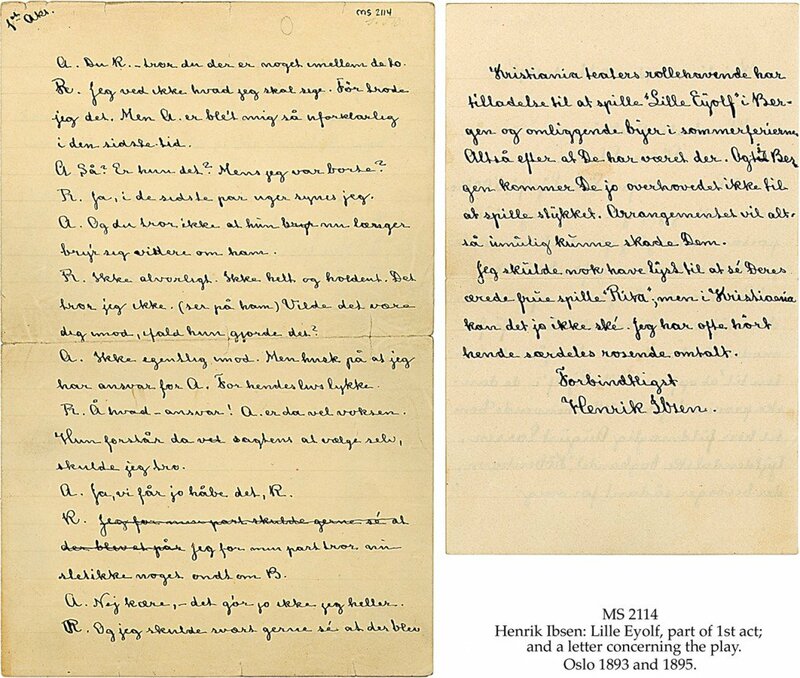 Description	 MS in Norwegian on paper, Oslo, Norway, July-August 1894 (text 1) and 10 March 1895 (text 2), 2+2 pp., 22x14 cm and 18x11 cm, single column (19x11 cm and 14x11 cm), 22 +16 lines in a regular cursive script, autograph, signed (text 2). Context	 Text 1 is Ibsen's rewriting of the crossed out section in quire 10 of the working autograph in National Library, NBO MS quarto 1117b. The final MS of text 1 for printing is in København: Det Kongelige Bibliotek, Collinske Samling 262, IV, 2. 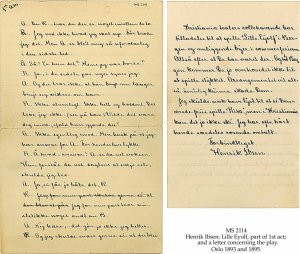 There are a number of further autograph Ibsen letters, documents and inscribed editions and photographs in The Schøyen Collection, which also holds the world's largest collection of text and binding variants of the Norwegian and Danish first editions and later editions until 1906, about 1,200 volumes, all different. Provenance	 1. Henrik Ibsen (1894 & 1895); 2. Text 2: Olaus Olsen, Bodø and Oslo (1895); 3. Text 1: Jonas Skougaard, Oslo; 4. Bjørn Hansson, Oslo (-1995); 5. Arild and Morten Hansson, Norway (1995-1996); 6: Damms Antikvariat cat. 650, Auksjon 18.4.1996:125; 7. Text 2: Acquired May 1996. Commentary	 Henrik Ibsen (1828-1906) Norwegian playwright. As for his contemporary plays, he is today internationally recognised as the foremost dramatist since Shakespeare. . Published	 København, Gyldendal, 1894, but in a different version than in the present MS. Henrik Ibsens Skrifter, vol.9, Oslo, 2009, pp.434-435. Text 2: Henrik Ibsens Skrifter, vol.15, Oslo, 2010, pp.294-295.